NEW YORK -- Thursday's winter storm pummeled the Tri-State Area, but imagine being in the thick of it on a cruise ship in the Atlantic Ocean. For 21 members of the Ross family, of Stony Brook, it was supposed to be the trip of a lifetime, CBS New York reports. They were cruising to the Bahamas for their patriarch's 80th birthday. Instead, they returned Friday after what they called a nightmare onboard the Norwegian Breakaway. "I thought I'd never be in a situation where I would say that's the scariest moment of my life. This was the worst moment of my life," said Karoline Ross, speaking exclusively with CBS New York. She and Del Ross spoke with the station while they were en route to New York, after they said their 4,000 passenger cruise ship sailed right into the storm Tuesday night for two harrowing days in ocean swells up to 30 feet. The seasoned boaters called it traumatic. "When you're on a boat in the middle of the ocean and water is pouring down the stairs, you're thinking 'this is not going to end well," Karoline said. "Our room was full on two inches of water. The elevator shafts were dripping water everywhere," Del said. Water poured from the ceiling, as the ship began leaking. Passengers described panic and seasickness on social media. Dozens huddled in the ship's atrium to sleep. "There were people crying, everyone was throwing up. it was a nightmare," said Olivia Ross. "It was so tilted I was shaking." The family said there was broken glass everywhere and the showers were exploding. "I'm completely traumatized. I'll never go on any type of boat again in my life after this," fellow passenger Emma Franzese told CBS New York once the ship docked. "I was holding on for dear life. I honestly wasn't sure we were going to make it through the night. The boat was tilted like crazy," said passenger Conor Vogt. "Everything fell off our shelf, glasses broke in the middle of the night. There was no announcement made," passenger Luisa Franzese said. 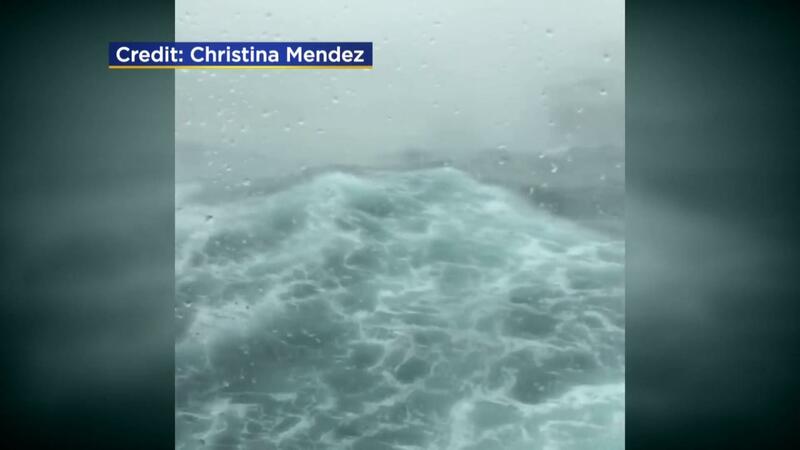 CBS New York asked Norwegian Cruise Line why the decision was made to sail back to New York in the middle of what was forecast to be a monster coastal storm. "Due to winter storm Grayson, Norwegian Breakaway will have a delayed arrival into New York today. As a result, Norwegian Breakaway's 14 day cruise that was originally scheduled to depart on January 5, will now depart on Saturday, January 6, at 3 p.m. Due to the ship's late arrival today, and the ongoing weather situation, embarking guests are encouraged to arrive to the pier on Saturday morning. All guests must be onboard by 1 p.m. on January 6. Guests unable to adjust their travel are welcome to board on Friday evening between 6 p.m. and 10 p.m. The ship will now sail a slightly adjusted itinerary, which will be communicated to guests onboard. All guests will receive a refund of one day of their cruise fare, in the form of an onboard credit. We sincerely thank our guests for their understanding of this unexpected change due to the weather and apologize to our guests for any disruption to their schedule," the statement said. "During the early morning hours of January 4, Norwegian Breakaway encountered stronger than forecasted weather conditions due to winter storm Grayson during the trip's return to New York from the Bahamas. All guests and crew are safe. We sincerely apologize to our guests for these stronger than expected weather conditions and any resulting discomfort they may have experienced." "The captain should've told us a little more. He kept saying, 'we're in rough seas.' Well no crap we're in rough seas," passenger Brenda Wriedt said. Elizabeth Vogt, of the Upper East Side, praised the crew. "Some of them were scared, but they put on a really happy face," she said, but added the ordeal was terrifying. "I flew across the room, landed in the bathroom, and then I got up, I got into my bed and said a prayer. That's how I felt that night." Back on terra firma, the Ross family said they will be asking for a refund for nine stateroom, but what they really want are answers. "He took all our lives in his hands, and we were really in a bad spot. It was really horrible," Karoline said. "It's more about revenue. It wasn't so much about safety," said Del. "We were dead center of the storm, and I really think it was a poor decision." "If they knew the storm was coming in, they should've already just taken us back. We'd rather get home a day early than have to go through something like this," fellow passenger Barbara Stevenson-Felder said. The Breakaway was supposed to embark on another cruise from the West Side on Friday, but instead will leave Saturday. CBS New York reached out to other cruise lines, including Royal Caribbean, which said its ships were safely south of the storm when it hit.